A day of theater fun. 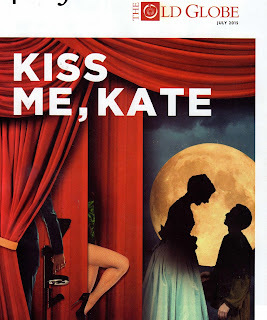 After that, drove to San Diego to the theater and saw a wonderful updated version of "Kiss Me Kate". It was great. We had gone to see it previously and one of the cast members was taken sick and they canceled the performance. Thanks to Marge for getting us the tickets- each time. “Kate” is, in its own over-the-top way, a complex piece of work — a play-within-a-play that pairs Shakespeare with the tropes of mid-20th-century musical comedy. and of course- Kiss me Kate. who looks surprising like my favorite picture of George. who made himself at home at my house several months ago? who met him while I was at the vet with him. George just lost his companion, Black. to move in with George. What about my new foundling Ivan? He was badly in need of a playmate. Even Tootie wouldn't play with Ivan. until she fully woke up and noticed. completely happy. He really wanted to play. would live in a big coyote-free area, I decided to do what was best for Ivan. Ivan's last night in my bed. I'm going to miss him. I think he's going to be much happier with George. So far, I've heard they're having a ball.